This article is about the 1917 revolution in Russia. For the 1848 revolution in France, see French Revolution of 1848. For the 2014 revolution in Ukraine, see 2014 Ukraine revolution. 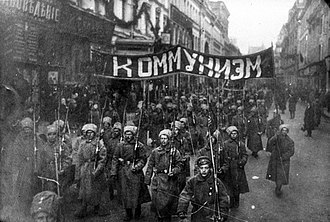 The February 1917 revolution ... grew out of pre-war political and economic instability, technological backwardness, and fundamental social divisions, coupled with gross mismanagement of the war effort, continuing military defeats, domestic economic dislocation, and outrageous scandals surrounding the monarchy. Despite its occurrence at the height of World War I, the roots of the February Revolution date further back. Chief among these was Imperial Russia's failure, throughout the 19th and early 20th century, to modernise its archaic social, economic and political structures while maintaining the stability of ubiquitous devotion to an autocratic monarch. As historian Richard Pipes writes, "the incompatibility of capitalism and autocracy struck all who gave thought to the matter". 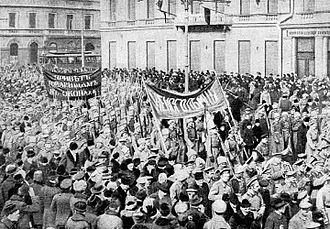 The first major event of the Russian Revolution was the February Revolution, which was a chaotic affair, caused by the culmination of over a century of civil and military unrest. There were many causes of this unrest of the common people towards the Tsar and aristocratic landowners. The causes can be summarized as the ongoing cruel treatment of peasants by the bourgeoisie, poor working conditions of industrial workers and the spreading of western democratic ideas by political activists. All of these causes led to a growing political and social awareness in the lower classes of Russia. Dissatisfaction of proletarians was compounded by food shortages and military failures. 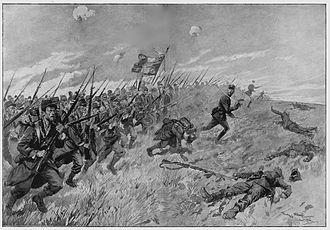 In 1905, Russia experienced humiliating losses in its war with Japan, then Bloody Sunday and the Revolution of 1905, in which Tsarist troops fired upon a peaceful, unarmed crowd. These events further divided Nicholas II from his people. Widespread strikes, riots and the famous mutiny on the Battleship Potemkin ensued. These conditions caused much agitation among the small working and professional classes. 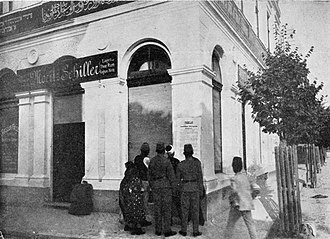 This tension erupted into general revolt with the 1905 Revolution, and again under the strain of war in 1917, this time with lasting consequences. 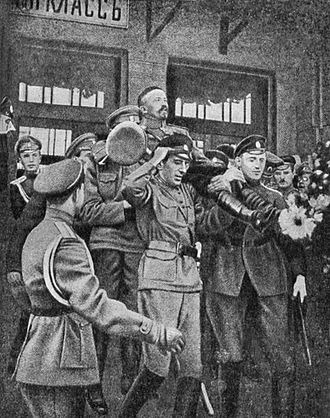 The revolution was provoked by Russian military failures during the First World War, as well as public dissatisfaction with the way the country was run on the home front. The economic challenges faced due to fighting a total war also contributed. In August 1914, all classes supported and virtually all political deputies voted in favour of the war. The declaration of war was followed by a revival of nationalism across Russian society, which temporarily reduced internal strife. The army achieved some early victories (such as in Galicia in 1915 and with the Brusilov Offensive in 1916) but also suffered major defeats, notably Tannenberg in August 1914, the Winter Battle in Masuria in February 1915 and the loss of Russian Poland during May to August 1915. Nearly six million casualties—dead, wounded and missing—had been accrued by January 1917. Mutinies sprang up more often (most due to simple war-weariness), morale was at its lowest, and the newly called up officers and commanders were at times very incompetent. Like all major armies, Russia's armed forces had inadequate supply. The pre-revolution desertion rate ran at around 34,000 a month. Meanwhile, the wartime alliance of industry, Duma (lower house of parliament) and Stavka (Military High Command) started to work outside the Tsar's control. In an attempt to boost morale and repair his reputation as a leader, Nicholas announced in the summer of 1915 that he would take personal command of the army, in defiance of almost universal advice to the contrary. The result was disastrous on three grounds. Firstly, it associated the monarchy with the unpopular war; secondly, Nicholas proved to be a poor leader of men on the front, often irritating his own commanders with his interference; and thirdly, being at the front made him unavailable to govern. This left the reins of power to his wife, the German Tsarina Alexandra, who was unpopular and accused of being a spy and under the thumb of her confidant, Grigori Rasputin, himself so unpopular that he was assassinated by members of the nobility in December 1916. The Tsarina proved an ineffective ruler in a time of war, announcing a rapid succession of different Prime Ministers and angering the Duma. The lack of strong leadership is illustrated by a telegram from Octobrist politician Mikhail Rodzianko to the Tsar on 26 February O.S. (11 March N.S), 1917, in which Rodzianko begged for a minister with the "confidence of the country" be instated immediately. Delay, he wrote, would be "tantamount to death". On the home front, a famine loomed and commodities became scarce due to the overstretched railroad network. Meanwhile, refugees from German-occupied Russia came in their millions. The Russian economy, which had just seen one of the highest growth rates in Europe, was blocked from the continent's markets by the war. Though industry did not collapse, it was considerably strained and when inflation soared, wages could not keep up. The Duma, which was composed of liberal deputies, warned Tsar Nicholas II of the impending danger and counselled him to form a new constitutional government, like the one he had dissolved after some short-term attempts in the aftermath of the 1905 Revolution. The Tsar ignored the advice. Historian Edward Acton argues that "by stubbornly refusing to reach any modus vivendi with the Progressive Bloc of the Duma... Nicholas undermined the loyalty of even those closest to the throne [and] opened an unbridgeable breach between himself and public opinion." In short, the Tsar no longer had the support of the military, the nobility or the Duma (collectively the élites), or the Russian people. The result was revolution. On 29 December O.S. (11 January N.S. ), a hesitating Nikolai Golitsyn became the successor of Trepov, who was dismissed. Golitsyn begged the Emperor to cancel his appointment, citing his lack of preparation for the role of Prime Minister. On 3 January O.S. (16 January N.S) Dmitry Shuvayev, who did not speak any foreign language, was succeeded by Mikhail Belyaev as Minister of War, likely at the request of the Empress. "In the seventeen months of the 'Tsarina's rule', from September 1915 to February 1917, Russia had four Prime Ministers, five Ministers of the Interior, three Foreign Ministers, three War Ministers, three Ministers of Transport and four Ministers of Agriculture. This "ministerial leapfrog", as it came to be known, not only removed competent men from power, but also disorganized the work of government since no one remained long enough in office to master their responsibilities." The Duma President Mikhail Rodzianko, Grand Duchess Marie Pavlovna and British ambassador Buchanan joined calls for Alexandra to be removed from influence, but Nicholas still refused to take their advice. Many people came to the conclusion that the problem was not Rasputin. According to Rodzianko the Empress "exerts an adverse influence on all appointments, including even those in the army." On 11 January O.S. (24 January N.S.) the Duma opening was postponed to the 25th (7 February N.S.). On 14 January O.S. (27 January N.S.) Georgy Lvov proposed to Grand Duke Nicholas that he take control of the country. At the end of January/beginning of February major negotiations took place between the allied powers in Petrograd; unofficially they sought to clarify the internal situation in Russia. On 14 February O.S. (27 February N.S.) police agents reported that army officers had, for the first time, mingled with the crowds demonstrating against the war and the government on Nevsky Prospekt. Kerensky took the opportunity to attack the Tsarist regime. By 1917, the majority of Russians had lost faith in the Tsarist regime. Government corruption was unrestrained, and Tsar Nicholas II had frequently disregarded the Imperial Duma. Thousands of workers flooded the streets of Petrograd (modern St. Petersburg) to show their dissatisfaction. The first major protest of the February Revolution occurred on 18 February O.S. (3 March N.S) as workers of Putilov Factory, Petrograd's largest industrial plant, announced a strike to demonstrate against the government. Strikes continued on the following days. Due to heavy snowstorms, tens of thousands of freight cars were stuck on the tracks, with the bread and fuel. On 22 February O.S. (7 March N.S.) the Tsar left for the front. On 23 February O.S. (8 March N.S. ), Putilov protesters were joined in the uprising by those celebrating International Woman's Day and protesting against the government's implemented food rationing. 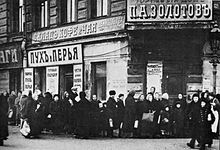 As the Russian government began rationing flour and bread, rumors of food shortages circulated and bread riots erupted across the city of Petrograd. Women, in particular, were passionate in showing their dissatisfaction with the implemented rationing system, and the female workers marched to nearby factories to recruit over 50,000 workers for the strikes. 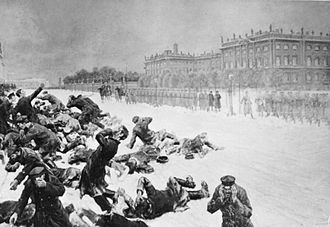 Both men and women flooded the streets of Petrograd, demanding an end to Russian food shortages, the end of World War I and the end of autocracy." By the following day 24 February O.S. (March 9 N.S), nearly 200,000 protesters filled the streets, demanding the replacement of the Tsar with a more progressive political leader. The protesting mob called for the war to end and for the Russian monarchy to be overthrown. 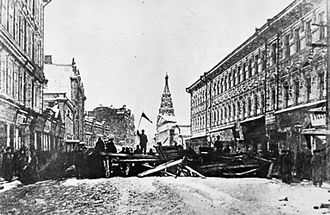 By 25 February O.S (10 March N.S), nearly all industrial enterprises in Petrograd were shut down by the uprising. Although all gatherings on the streets were absolutely forbidden some 250,000 people were on strike. The president of the Imperial Duma Rodzianko asked the chairman of the Council of Ministers Nikolai Golitsyn to resign; the minister of Foreign Affairs Nikolai Pokrovsky proposed the resignation of the whole government. There were disturbances on the Nevsky Prospect during the day and in the late afternoon four people were killed. 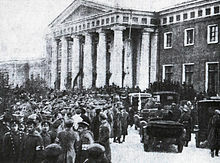 The Tsar took action to address the riots on 25 February O.S (10 March N.S) by wiring garrison commander General Sergey Semyonovich Khabalov, an inexperienced and extremely indecisive commander of the Petrograd military district, to disperse the crowds with rifle fire and to suppress the "impermissible" rioting by force. On the 26 February O.S (11 March N.S) the centre of the city was cordoned off. 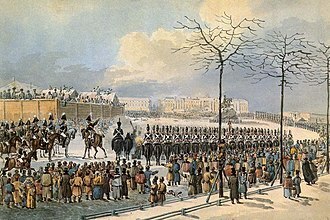 During the late afternoon of 26 February O.S (11 March N.S) the Fourth Company of the Pavlovski Replacement Regiment broke out of their barracks upon learning that another detachment of the regiment had clashed with demonstrators near the Kazan Cathedral. After firing at mounted police the soldiers of the Fourth Company were disarmed by the Preobrazhensky Regiment. 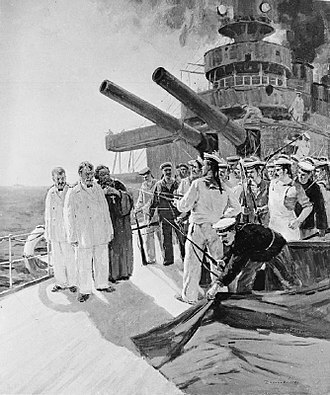 This marked the first instance of open mutiny in the Petrograd garrison. On the next day (27 February O.S, 12 March N.S), the Duma remained obedient, and "did not attempt to hold an official sitting". Then some delegates decided to form a Provisional Committee of the State Duma, led by Rodzianko and backed by major Moscow manufacturers and St. Petersburg bankers. Its first meeting was on the same evening and ordered the arrest of all the ex-ministers and senior officials. The Duma refused to head the revolutionary movement. At the same time, socialists also formed the Petrograd Soviet. In the Marinsky Palace the Council of Ministers of Russia, assisted by Rodzyanko, held its last meeting. Protopopov was told to resign and offered to commit suicide. The Council formally submitted its resignation to the Tsar. By nightfall, General Khabalov and his forces faced a capital controlled by revolutionaries. 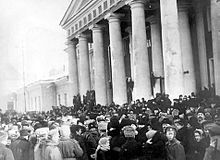 The protesters of Petrograd burned and sacked the premises of the district court, the headquarters of the secret police, and many police stations. They also occupied the Ministry of Transport, seized the arsenal, and released prisoners into the city. Army officers retreated into hiding and many took refuge in the Admiralty building, but moved that night to the Winter Palace. The situation is serious. The capital is in a state of anarchy. The Government is paralyzed. Transport service and the supply of food and fuel have become completely disrupted. General discontent is growing ... There must be no delay. Any procrastination is tantamount to death. —  Rodzianko's first telegram to the Tsar, 11 March [O.S. 26 February] 1917. Nicholas's response on 27 February O.S (12 March N.S), perhaps based on the Empress's earlier letter to him that the concern about Petrograd was an over-reaction, was one of irritation that "again, this fat Rodzianko has written me lots of nonsense, to which I shall not even deign to reply". Meanwhile, events unfolded in Petrograd. The bulk of the garrison mutinied, starting with the Volynsky Life Guards Regiment. Soldiers of this regiment brought the Litovsky, Preobrazhensky, and Moskovsky Regiments out on the street to join the rebellion, resulting in the hunting down of police and the gathering of 40,000 rifles which were dispersed among the workers. Even the Cossack units that the government had come to use for crowd control showed signs that they supported the people. Although few actively joined the rioting, many officers were either shot or went into hiding; the ability of the garrison to hold back the protests was all but nullified. 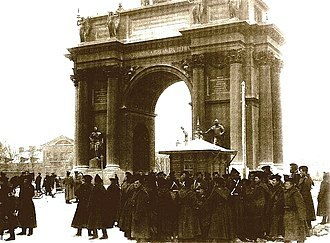 Symbols of the Tsarist regime were rapidly torn down around the city and governmental authority in the capital collapsed — not helped by the fact that Nicholas had earlier that day suspended a session in the Duma that was intended to discuss the issue further, leaving it with no legal authority to act. Attempts were made by high-ranking military leaders to persuade the Tsar to resign power to the Duma in an effort to collapse war efforts and establish far-left power. The response of the Duma, urged on by the Progressive Bloc, was to establish a Provisional Committee to restore law and order; the Provisional Committee declared itself the governing body of the Russian Empire. "Chief among them was the desire to bring the war to a successful conclusion in conjunction with the Allies; and the very cause of their opposition was the ever deepening conviction that this was unattainable under the present government and under the present regime. 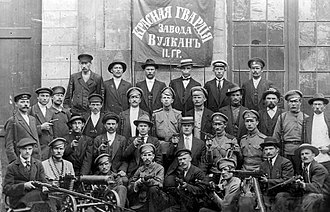 Meanwhile, the socialist parties re-established the Petrograd Soviet, first created during the 1905 revolution, to represent workers and soldiers. The remaining loyal units switched allegiance the next day. On 28 February, Rodzianko invited the Grand Duke Paul Alexandrovich and Grand Duke Kirill Vladimirovich to put their signatures to the drafting of the Manifesto, in which Emperor Nicholas II was recommended to introduce the constitutional system in Russia. 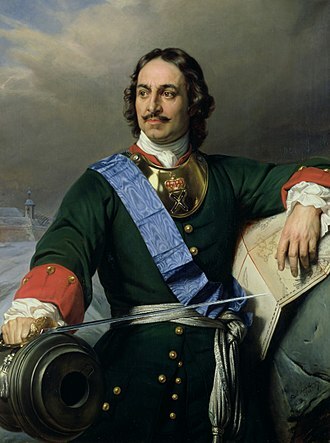 Rodzianko said that the Emperor will be asked to sign this Manifesto on 1 March at the station of Tsarskoe Selo immediately after his return. Late in the evening the text "Grand Manifesto" was signed by the Grand Dukes Paul Alexandrovich, Kirill Vladimirovich and Grand Duke Dmitry Konstantinovich. But the Empress refused to sign the draft. "I'm not a ruler – said the Empress – and have no rights to take the initiative in the absence of the Emperor. Moreover, this paper may not be only illegal, but useless." 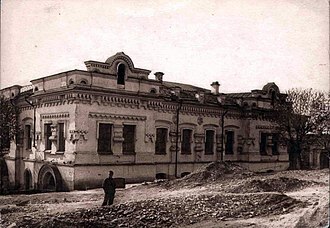 On 28 February O.S (13 March N.S), at five in the morning, the Tsar left Mogilev, (and also directed Nikolay Iudovich Ivanov to go to Tsarskoe Selo) but was unable to reach Petrograd as revolutionaries controlled railway stations around the capital. Around midnight the train was stopped at Malaya Vishera, turned, and in the evening of 1 March O.S (14 March N.S) Nicholas arrived in Pskov. In the meantime the units guarding the Alexander Palace in Tsarskoe Selo either "declared their neutrality" or left for Petrograd and thus abandoned the Imperial Family. The Provisional Committee declared itself the governing body of the Russian Empire. The Army Chief Nikolai Ruzsky, and the Duma deputies Vasily Shulgin and Alexander Guchkov who had come to advise the Tsar, suggested that he abdicate the throne. He did so on behalf of himself and his son, Tsarevich Alexei. At 3 o'clock in the afternoon of Thursday, 2 March O.S (15 March N.S), Nicholas nominated his brother, the Grand Duke Michael Alexandrovich, to succeed him. The next day the Grand Duke realised that he would have little support as ruler, so he declined the crown, stating that he would take it only if that was the consensus of democratic action by the Russian Constituent Assembly, which shall define the form of government for Russia. The 300 year-old Romanov dynasty ended with the Grand Duke's decision on 3 March O.S (17 March N.S). On 8 March O.S (22 March N.S) the former Tsar, addressed with contempt by the sentries as "Nicholas Romanov", was reunited with his family at the Alexander Palace at Tsarskoye Selo. He and his family and loyal retainers were placed under protective custody by the Provisional Government in the palace. The February Revolution immediately caused widespread excitement in Petrograd. On 3 March O.S (16 March N.S), a provisional government was announced by the Provisional Committee of the State Duma. The Provisional Government published its manifesto declaring itself the governing body of the Russian Empire that same day. The manifesto proposed a plan of civic and political rights and the installation of a democratically elected Russian Constituent Assembly, but did not touch on many of the topics that were driving forces in the revolution such as participation in World War I and land. At the same time, the Petrograd Soviet (or workers' council) began organizing and was officially formed on 27 February. The Petrograd Soviet and the Provisional Government shared dual power over Russia. The term dual power came about as the driving forces in the fall of the monarchy, opposition to the human and widespread political movement, became politically institutionalized. The orders of the Military Commission of the State Duma [part of the organisation which became the Provisional Government] shall be executed only in such cases as do not conflict with the orders and resolution of the Soviet of Workers' and Soldiers' Deputies. —  Point 4 of Order No. 1, 1 March 1917. Order No. 1 ensured that the Dual Authority developed on the Soviet's conditions. The Provisional Government was not a publicly elected body (having been self-proclaimed by committee members of the old Duma) and it lacked the political legitimacy to question this arrangement and instead arranged for elections to be held later. The Provisional Government had the formal authority in Russia but the Soviet Executive Committee and the soviets had the support of the majority of the population. The soviets held the real power to effect change. The Provisional Government represented an alliance between liberals and socialists who wanted political reform. The initial soviet executive chairmen were Menshevik Mikola Ckheidze, Matvey Skobelev and Alexander Kerensky. The chairmen believed that the February Revolution was a "Bourgeois revolution" about bringing capitalist development to Russia instead of socialism. The center-left was well represented, and the government was initially chaired by a liberal aristocrat, Prince Georgy Yevgenyevich Lvov, a man with no connections to any official party. The Provisional government included 9 Duma deputies and 6 from the Kadet party in ministerial positional, representing professional and business interests, the bourgeoisie. As the left moved further left in Russia over the course of 1917, the Kadets became the main conservative party. Despite this, the provisional government strove to implement further left leaning policies with the repeal of the death penalty, amnesty for political prisoners and freedom of the press. Dual Power was not prevalent outside of the capital and political systems varied from province to province. One example of a system gathered the educated public, workers and soldiers to facilitate order and food systems, democratic elections and the removal of tsarist officials. In a short amount of time, 3,000 deputies were elected to the Petrograd soviet. The soviet quickly became the representative responsible for fighting for workers and soldiers hopes for "bread, peace and land". In the spring of 1917, 700 soviets were established across Russia, equalling about a third of the population, representing the proletariat and their interests. The soviets spent their time pushing for a constituent assembly rather than swaying the public to believe they were a more morally sound means of governing. After the abdication of the throne by the Tsar, the Provisional Government declared itself the new form of authority. The Provisional Government shared Kadet views. The Kadets began to be seen as a conservative political party and as "state-minded" by other Russians. At the same time that the Provisional Government was put into place, the Soviet Executive Committee was also forming. The Soviet represented workers and soldiers, while the Provisional Government represented the middle and upper social classes. The Soviet also gained support from Social Revolutionists and Mensheviks when the two groups realized that they did not want to support the Provisional Government. When these two powers existed at the same time, "dual power" was created. The Provisional Government was granted formal authority, but the Soviet Executive Committee had the support of the people resulting in political unrest until the Bolshevik takeover in October. A scene from the July Days. The army had just opened fire on street protesters. Vladimir Lenin, exiled in neutral Switzerland, arrived in Petrograd from Zürich on 16 April O.S (29 April N.S). He immediately began to undermine the provisional government, issuing his April Theses the next month. These theses were in favor of "Revolutionary defeatism", which argues that the real enemy is those who send the proletariat into war, as opposed to the "imperialist war" (whose "link to Capital" must be demonstrated to the masses) and the "social-chauvinists" (such as Georgi Plekhanov, the grandfather of Russian socialism), who supported the war. The theses were read by Lenin to a meeting of only Bolsheviks and again to a meeting of Bolsheviks and Mensheviks, both being extreme leftist parties, and was also published. He believed that the most effective way to overthrow the government was to be a minority party and to give no support to the Provisional Government. Lenin also tried to take control of the Bolshevik movement and attempted to win proletariat support by the use of slogans such as "Peace, bread and land", "End the war without annexations or indemnities", "All power to the Soviet" and "All land to those who work it". Initially, Lenin and his ideas did not have widespread support, even among Bolsheviks. In what became known as the July Days, approximately half a million soldiers, sailors, and workers, some of them armed, came out onto the streets of Petrograd in protest. The protesters seized automobiles, fought with people of authority, and often fired their guns into the air. The crowd was so uncontrollable that the Soviet leadership sent the Socialist Revolutionary Victor Chernov, a widely liked politician, to the streets to calm the crowd. The demonstrators, lacking leadership, disbanded and the government survived. Leaders of the Soviet placed the blame of the July Days on the Bolsheviks, as did the Provisional Government who issued arrest warrants for prominent Bolsheviks. Historians debated from early on whether this was a planned Bolshevik attempt to seize power or a strategy to plan a future coup. Lenin fled to Finland and other members of the Bolshevik party were arrested. Lvov was replaced by the Socialist Revolutionary minister Alexander Kerensky as head of the Provisional Government. Kerensky declared freedom of speech, ended capital punishment, released thousands of political prisoners and tried to maintain Russian involvement in World War I. He faced many challenges related to the war: there were still very heavy military losses on the front; dissatisfied soldiers deserted in larger numbers than before; other political groups did their utmost to undermine him; there was a strong movement in favor of withdrawing Russia from the war, which was seen to be draining the country, and many who had initially supported it now wanted out; and there was a great shortage of food and supplies, which was very difficult to remedy in wartime conditions. All of these were highlighted by the soldiers, urban workers, and peasants who claimed that little had been gained by the February Revolution. Kerensky was expected to deliver on his promises of jobs, land, and food almost instantaneously, and failed to do so. The Kornilov Affair arose when Commander-in-Chief of the Army, General Lavr Kornilov, directed an army under Aleksandr Krymov to march toward Petrograd with Kerensky's agreement. Although the details remain sketchy, Kerensky appeared to become frightened by the possibility of a coup and the order was countermanded. (Historian Richard Pipes is adamant that the episode was engineered by Kerensky). On 27 August O.S (9 September N.S), feeling betrayed by the Kerensky government, who had previously agreed with his views on how to restore order to Russia, Kornilov pushed on towards Petrograd. With few troops to spare on the front, Kerensky was turned to the Petrograd Soviet for help. 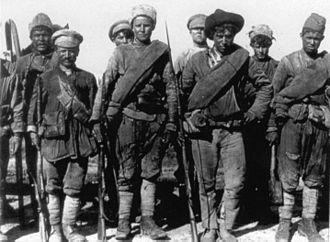 Bolsheviks, Mensheviks and Socialist Revolutionaries confronted the army and convinced them to stand down. Right-wingers felt betrayed, and the left wing was resurgent. Pressure from the Allies to continue the war against Germany put the government under increasing strain. The conflict between the "diarchy" became obvious, and ultimately the regime and the dual power formed between the Petrograd Soviet and the Provisional Government, instigated by the February Revolution, was overthrown by the Bolsheviks in the October Revolution. When discussing the historiography of the February Revolution there are three historical interpretations which are relevant: Soviet, Liberal and Revisionist. These three different approaches exist separately from one another because of their respective beliefs of what ultimately caused the collapse of a Tsarist government in February. Soviet historians present a story in which the masses that brought about revolution in February were organized groups of 'modernizing' peasants who were bringing about an era of both industrialization and freedom. Soviet historian Sokolov has been outspoken about the belief that the revolution in February was a coming together of the people and was more positive than the October revolution. Soviet historians consistently place little emphasis on the role of World War I (WWI) in leading to the February Revolution. In contrast, Liberal perspectives of the February revolution almost always acknowledge WWI as a catalyst to revolution. On the whole, though, Liberal historians credit the Bolsheviks with the ability to capitalize on the worry and dread instilled in Russian citizens because of WWI. The overall message and goal of the February Revolution, according to the Liberal perspective, was ultimately democracy; the proper climate and attitude had been created by WWI and other political factors which turned public opinion against the Tsar. Revisionist historians present a timeline where revolution in February was far less inevitable than the liberals and soviets would make it seem. Revisionists track the mounting pressure on the Tsarist regime back further than the other two groups to unsatisfied peasants in the countryside upset over matters of land-ownership. This tension continued to build into 1917 when dissatisfaction became a full blown institutional crisis incorporating the concerns of many groups. Revisionist historian Richard Pipes has been outspoken about his anti-communist approach to the Russian Revolution. Out of these three approaches, all of them have received modern criticism. The February Revolution is seen by many present-day scholars as an event which gets "mythologized". ^ On February 8, 1917 on request of the Emperor N. Maklakov and Protopopov drafted the text of a manifesto to dissolve the Duma (before it was opened on 14 February 1917). ^ Orlando Figes (2008). A People's Tragedy. First. p. 321. ISBN 9780712673273. ^ Aluf, I. A. (1979). February Bourgeois Democratic Revolution of 1917. The Great Soviet Encyclopedia (3rd ed.). The Gale Group, Inc.
^ The revolution occurred in March according to the Western calendar, and in February according to the calendar Russia was using at the tune. ^ History of the Women's Day. United Nations website. ^ a b c Steinberg, Mark (2017). The Russian Revolution. Oxford University Press. p. 69. ISBN 978-0-19-922762-4. ^ a b c d Curtis 1957, p. 30. ^ a b c Acton 1990, pp. 107–108. ^ Pipes 2008, p. 18. ^ a b c d Fitzpatrick 2008, p. 38. ^ Service 2005, p. 26. ^ Of 422, only 21 voted against. Beckett 2007, p. 516. ^ Beckett 2007, pp. 521–522. ^ Beckett 2007, p. 525. ^ Beckett 2007, p. 518. ^ 1953-, Steinberg, Mark D. (2017). The Russian Revolution, 1905-1921 (First ed.). Oxford. ISBN 9780199227631. OCLC 965469986. ^ a b c d Browder & Kerensky 1961, p. 40. ^ Beckett 2007, p. 513. ^ Beckett 2007, p. 516. ^ Fitzpatrick 2008, pp. 39–40. ^ А.В., Евдокимов. "Последний военный министр Российской империи - Конкурс молодых историков "Наследие предков - молодым"". ^ "The Russian diary of an Englishman, Petrograd, 1915-1917". ^ February Revolution Begins in Russia. ^ a b c Curtis 1957, p. 1. ^ "Letters from Tsar Nicholas to Tsaritsa Alexandra - February 1917". ^ a b c Williams 1987, p. 9. ^ When women set Russia ablaze 2007. ^ Montefiore, Simon Sebag (2016). The Romanovs 1613–1918. p. 612. ISBN 978-0-297-85266-7. ^ Salisbury, Harrison E. (1981). Black Night White Snow. p. 372. ISBN 978-0-306-80154-9. ^ Ф. А. Гайда, к.и.н., исторический факультет МГУ им. М. В. Ломоносова. "Министр внутренних дел Н. А. Маклаков: политическая карьера русского Полиньяка"
^ Salisbury, Harrison E. (1981). Black Night White Snow. pp. 349–350. ISBN 978-0-306-80154-9. ^ Orlando Figes (2006) A People's Tragedy: The Russian Revolution: 1891–1924, pp. 328–329. ^ a b c Wildman 1970, p. 8. ^ Wade 2005, p. 37. ^ a b c Beckett 2007, p. 523. ^ Wade 2005, pp. 40–43. ^ "Откуда Россия шагнула в пропасть… — Русское Имперское Движение". ^ Browder & Kerensky 1961, p. 116. ^ a b c d Smith, S.A. Russia in Revolution. Oxford University Press. p. 102. ^ Tames 1972, p. [page needed]. ^ Service 1986, p. [page needed]. ^ Malone 2004, p. 92. ^ a b c d e Smith, S.A. Russia in Revolution. Oxford University Press. pp. 104–106. ^ a b c d e Smith, S. A. Russia in Revolution. Oxford University Press. pp. 104–106. ^ Service 2005, p. 57. ^ Service 2005, p. 34. ^ "April Thesis". Seventeen Moments in Soviet History. 2015-08-12. Retrieved 2017-11-01. ^ 1953-, Steinberg, Mark D. (2017). The Russian Revolution, 1905-1921 (First ed.). Oxford. pp. 78–79. ISBN 9780199227631. OCLC 965469986. ^ Critical companion to the Russian Revolution, 1914-1921. Acton, Edward., Cherni︠a︡ev, V. I︠U︡., Rosenberg, William G. Bloomington: Indiana University Press. 1997. ISBN 978-0253333339. OCLC 36461684. ^ 1953-, Steinberg, Mark D. (2001). Voices of revolution : 1917. New Haven, CT: Yale University Press. pp. 161–165. ISBN 9780300101690. OCLC 50418695. ^ Bradley, Joseph (2017). "The February Revolution". Russian Studies in History. 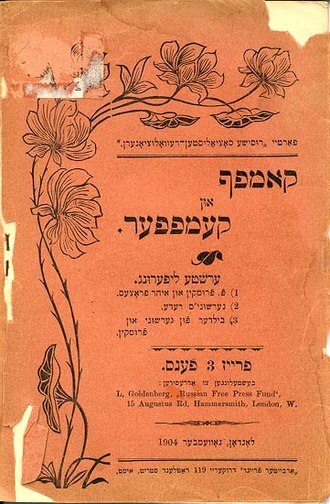 56 (1): 1–5. doi:10.1080/10611983.2017.1326247. ^ Wildman, Allan (1970). 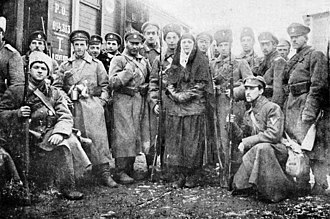 "The February Revolution in the Russian Army". Soviet Studies. 22: 23. ^ O'Connor, Timothy E. (1995). "Review of Rethinking the Russian Revolution". Studies in East European Thought. 47 (1/2): 133–138. JSTOR 20099569. ^ "February's forgotten vanguard | International Socialist Review". isreview.org. Retrieved 2017-11-08. 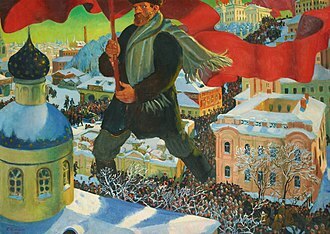 Wikimedia Commons has media related to February Revolution (Russia). Curtiss, John Shelton (1957). The Russian Revolutions of 1917: documents. Van Nostrand. ISBN 978-0442000165. Malone, Richard (2004). Analysing the Russian Revolution. Australia: Cambridge University Press. p. 67. ISBN 978-0-521-54141-1. Rabinowitch, Alexander (2008). The Bolsheviks in Power: The First Year of Soviet Rule in Petrograd. Indiana UP. p. 1. ISBN 978-0253220424. 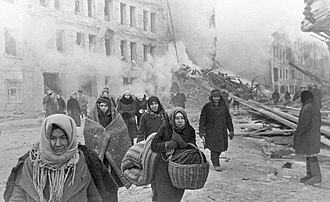 "When women set Russia ablaze". fifthinternational.org. League for the Fifth International. 11 July 2007. Retrieved 1 September 2012. 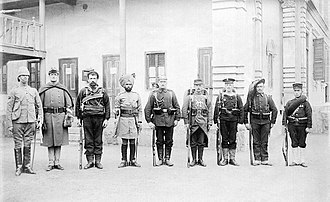 The Special Corps of Gendarmes was the uniformed security police of the Russian Empire in the 19th and early 20th centuries. Its main responsibilities were law enforcement and state security, the responsibilities of the Gendarmes included the execution of court orders, pursuit of fugitives, riot control, and detainment of unusual criminals. Gendarmes could be assigned to assist local police and officials, the precursors of the Corps were the Army Gendarmerie regiment, created in 1815 and based on the Borisoglebsk Dragoon Regiment, and Gendarmerie units of the Special Corps of the Internal Guards. 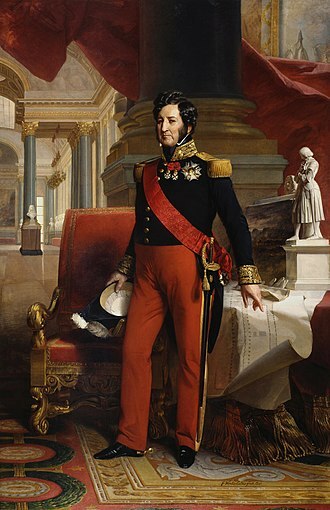 In 1836, the Gendarmerie of the Internal Guards was transformed into the Special Corps of Gendarmes, the Commander of the Corps and Chief of Staff of the Corps were Directors of the Third Section under the Executive Director. The Corps was divided into seven territorial Districts, six of them located in Russia and one in the Kingdom of Poland, the Main Directorate, along with additional Gubernial Directorates, was created. Progressive Bloc was an alliance of political forces in the Russian Empire and occupied 236 of the 442 seats in the Imperial Duma. It was formed when the State Duma of the Russian Empire was recalled to session during World War I, according to the Bolsheviks it supported a social-chauvinist stance towards the continuation of World War I. The program content was determined by the desire to find common ground for an agreement with the government on the basis of a minimum of liberal reforms. The Progressive Bloc’s program included demands for political and religious amnesty, the abolition of restrictions on nationalities and faiths, the Bloc’s main demand was the formation of a “ministry of confidence. The negotiations resulted in the government advocating for the Duma’s suspension, the Imperial Duma was sent into recess by the Tsar and would not gather again until February 1916. By the beginning of 1916, Alexei Khvostov came to a compromise with the Progressive Bloc, the Duma gathered on 9 February after the 76-year-old Ivan Goremykin, opposed to the convening of the Duma, had been dismissed and replaced by Stürmer as prime minister. The Ministry of Internal Affairs of the Russian Federation is the interior ministry of Russia. Its predecessor was founded in 1802 by Alexander I in Imperial Russia, the Ministry is headquartered in Moscow. The current Minister of Internal Affairs is General of Police Vladimir Kolokoltsev, as the central government began to further partition the countryside, the ispravniks were distributed among the sections. Serving under them in their localities were commissaries. These uryadniks rapidly became the terror of the countryside and its most famous development was the so-called Third Section instituted by the emperor Nicholas I in 1826. This was entirely independent of the police, but was associated with the previously existing Special Corps of Gendarmes. 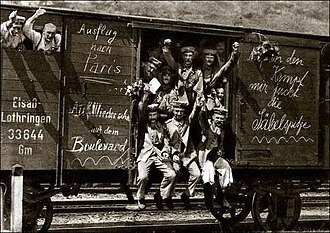 By World War I, the Department had spawned a counter-intelligence section, after the February Revolution of 1917, the Gendarmes and the Okhrana were disbanded as anti-revolutionary. Having won the October Revolution, the Bolsheviks disbanded the tsarist police forces and formed an all-proletarian Workers, after the establishment of the USSR there was no Soviet NKVD until 1934. In March 1946, all of the Peoples Commissariats were redesignated as Ministries, the NKVD was renamed the MVD of the USSR, along with its former subordinate, the NKGB which became the MGB of the USSR. The NKVDs of Union Republics became Ministries of Internal Affairs subordinate to MVD of the USSR, Secret police became a part of MVD after Lavrenty Beria merged the MGB into the MVD in March 1953. Within a year Berias downfall caused the MVD to be split up again, after that, in his efforts to fight bureaucracy and maintain Leninist principles, Nikita Khrushchev, as the Premier of the Union, called for the dismissal of the All-Union MVD. The Ministry ceased to exist in January 1960 and its functions were transferred to the respective Republican Ministries, the MVD of the Russian SFSR was renamed the Ministry for Securing the Public Order in 1962. The MVD regained its title in 1968. Another role of the reformed MVD was to combat economic crimes and this fight was never successful due to the pervasive nature of the black market. Prince Georgy Yevgenyevich Lvov was a Russian statesman and the first post-imperial prime minister of Russia, from 15 March to 21 July 1917. Prince Lvov was born in Dresden and descended from the sovereign Viking princes of Yaroslavl and his family moved home to Popovka in the Aleksin district of Tula Governorate from Germany soon after his birth. He graduated from the University of Moscow with a degree in law, during the Russo-Japanese War he organized relief work in the East and in 1905, he joined the liberal Constitutional Democratic Party. A year he won election to the First Duma, and was nominated for a ministerial position and he married Countess Julia Alexeievna Bobrinskaya, great-great-granddaughter of Grigory Orlov and Catherine the Great, without issue. During the first Russian Revolution and the abdication of Nicholas II, emperor of Russia, unable to rally sufficient support, he resigned in July 1917 in favour of his Minister of War, Alexander Kerensky. Lvov was arrested when the Bolsheviks seized power that year and he escaped and settled in Paris, where he spent the rest of his life. World War I caricature from Russia depicting Wilhelm II, Franz Joseph I and Mehmed V. Top: "If only we could get to the top – it would be ours!" Bottom: "Let me help you with that!" Saint Petersburg Police Ford Focus patrol car near Saint Isaac's Cathedral. Hall of the Sessions of the State Duma. What the October Revolution gave to the female worker and peasant. 1920 Soviet propaganda poster. The inscriptions on the buildings read "library", "kindergarten", "school for grown-ups", etc.